Today’s highly connected organizations move vast amounts of business-critical data across networks. The value of this data is extraordinary – as is the ability to move it quickly, reliably and securely. In order to maintain and safeguard business continuity these organizations must employ advanced features such as fast, secure VPN access, highly reliable network connectivity, powerful performance and flexible, scalable configurability. The SonicWALL PRO 4060, part of SonicWALL’s PRO Series Internet Security Platform, provides complete business continuity for even the most complex networks. Powered by SonicWALL’s next-generation SonicOS 2.0 operating system, the PRO 4060 delivers enterprise-class firewall throughput and VPN concentration. Unbeatable price/performance characteristics make the PRO 4060 the ideal solution for companies that need rock solid network protection coupled with fast, secure VPN access for remote employees. The SonicWALL PRO 4060 provides hardware fail-over, WAN ISP fail-over and an automated secondary VPN gateway, ensuring continuous network uptime. Six fully configurable 10/100 Ethernet interfaces allow administrators to create multiple LANs, WANs, DMZs and custom-defined zones. The PRO 4060 also integrates seamlessly with the SonicWALL suite of security services, including Complete Anti-Virus and Content Filtering Service, for an added layer of protection. Combined with an innovative Web interface, the PRO 4060 is the ultimate choice for robust internal and external security, network configuration flexibility and ease of use. The PRO 4060 can be easily managed remotely as part of a multi-firewall and VPN environment through a Web interface or using SonicWALL’s industry-leading Global Management System (GMS). This gives network administrators an economical yet powerful set of tools for rapid deployment, configuration, and management of global security policies from a central location. WAN ISP Fail-over and Load Balancing. The PRO 4060 offers the ability to designate one of the user-assigned ports as a secondary WAN port that can be used in "active-passive" fail-over configuration, providing a highly efficient method for distributing or load sharing outbound WAN traffic. Dedicated High-performance Encryption ASIC. By offloading processing overhead associated with encryption, the PRO 4060 deliver the best possible performance: up to 300+ Mbps Stateful Packet Inspection Firewall and 190 Mbps 3DES and AES VPN throughput. Hardware AES Support. The PRO 4060 reflects SonicWALL’s commitment to next-generation open security standards by including hardware-based acceleration support for the AES encryption algorithm. 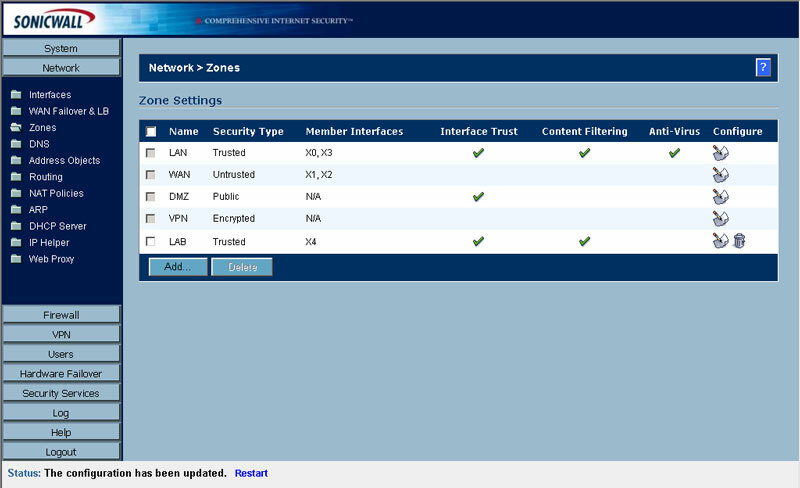 Multiple Interfaces per Security Zone. Network administrators can group multiple physical interfaces on the PRO 4060 into logical "Zones" for ease of management and flexibility. This provides tremendous flexibility, scalability and added internal security when deploying SonicWALL firewalls in various network topologies. Object/Policy-based Management. The PRO 4060 provides the ability to define an object such as a user group, network, service or interface. When security policies change, the administrator can modify the pre-defined object and propagate the changes instantly without redefining rules. 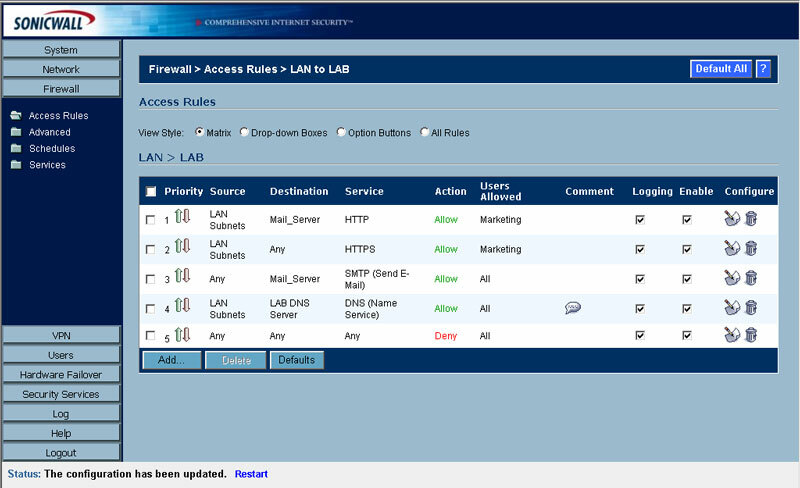 This enables businesses to implement and manage security policies easily and consistently. Policy-based NAT. 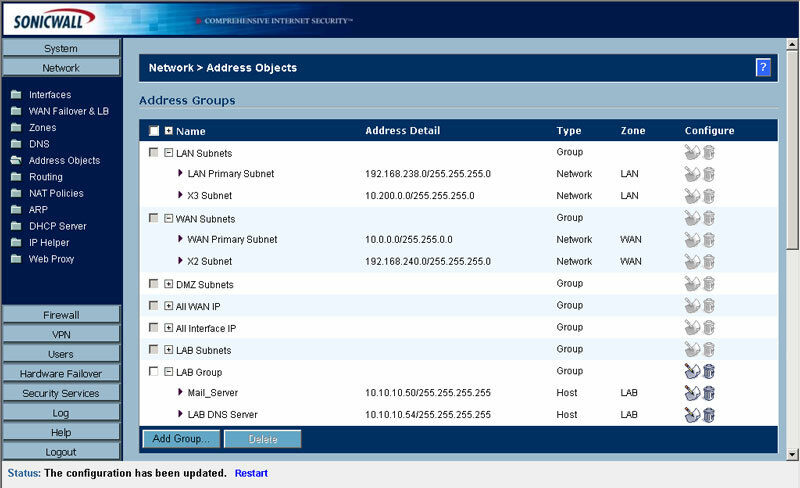 In addition to NAT (many-to-one) functionality, the PRO 4060 exposes control of NAT policies to administrators for one-to-one NAT, many-to-many NAT, one-to-many NAT, inbound Port Address Translation (PAT), flexible NAT (for overlapping IP addresses), as well as NAT policies on selective source/destination/source translations. The result is greater control and flexibility to support and manage various NAT requirements. Comprehensive Central Management. SonicWALL's award-winning Global Management System provides network administrators with the tools for simplified configuration, enforcement and management of global security policies, VPN and services, all from a central location.